Standing alongside award winner Madina Zongo are Nicole Prieur, Full Professor and Co-Director of the maîtrise en droit (LL. M.) – fiscalité, and Maurice Mongrain, President and CEO, APFF. Madina Zongo, a recent graduate of the HEC Montréal maîtrise en droit (LL. 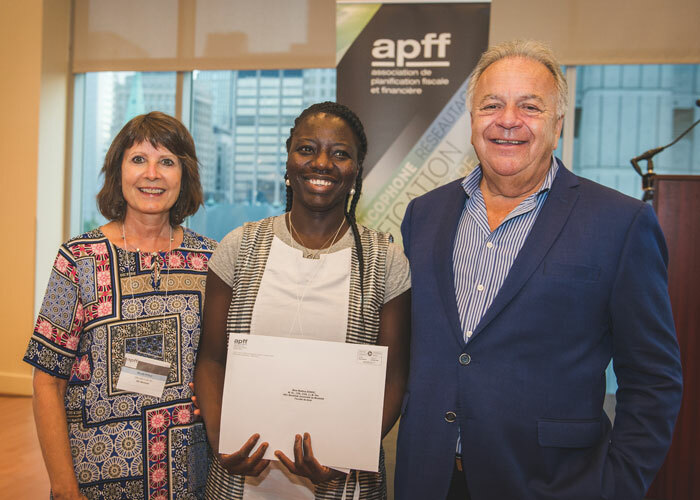 M.) – fiscalité program, has received a $2,500 award at a Next Generation cocktail party organized by the Association de planification fiscale et financière (APFF) in Montréal this past fall. Currently working as Income Tax Department Head at Air Canada, Zongo earned this honour for her directed study Nouveaux principes de l’OCDE en matière de documentation des prix de transfert: analyse et discussion (new OECD principles in documentation of transfer prices: analysis and discussion. This study presents the rules established by the Organization for Economic Cooperation and Development (OECD) on documentation of transfer prices, and describes their introduction, country by country. The study also examines the responses by several countries, including Canada and the United States, to these new recommendations, along with their implications for tax specialists working in this area. Lastly, it includes a critical discussion of the OECD measures, looks at the compliance issues for multinational groups and for tax authorities, and raises the question of the confidentiality of information.